Gift from Gentleman A classic combo given by true gentleman! 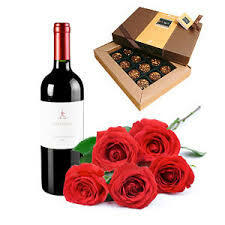 Your lady will thank you for the lovely bouquet of 5 long-stem roses, box of delicious chocolates and a bottle of Dry Red Wine. The flowers are hand-selected.